Home Facts How can Moringa Oleifera really help with weight loss? We’ve always hesitated to claim that Moringa can help with weight loss directly because there had been no scientific studies analyzing just that… until now. 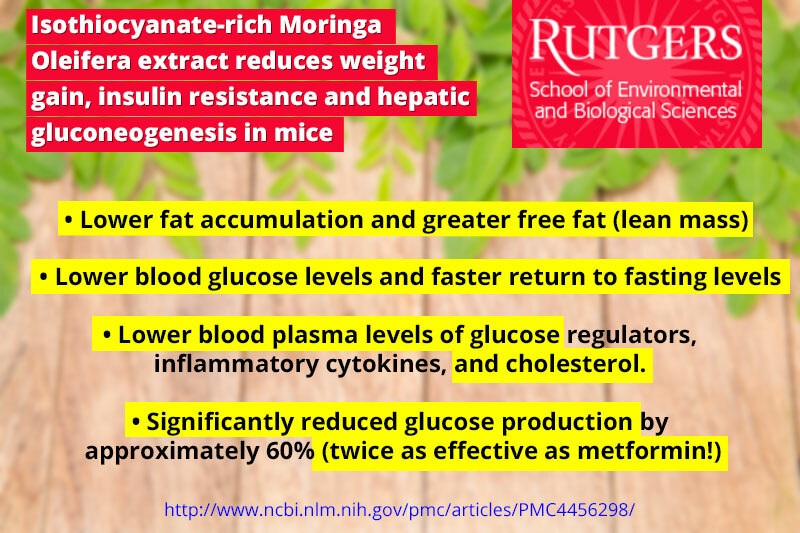 New research done by Rutgers University in the United States has proven, at long last, that Moringa does directly help you lose weight and prevent & treat type 2 diabetes. The hidden secret is four unique Moringa Isothiocyanates (MICs), with strong biological activity found in Moringa leaves. Emerging evidence has suggested these MICs are the principal therapeutically active constitutes found in Moringa. This study provides justification and preliminary evidence for the uses of Moringa as a dietary agent in preventing Type 2 Diabetes by demonstrating that MICs caused significant reduction in weight gain, hepatic adiposity, gluconeogenesis, insulin, cholesterol, and inflammatory markers; and increase in insulin signaling sensitivity and lipolysis. Our study also provides support for the role of MICs as primary anti-diabetic actives in Moringa. This all results in steady, healthy weight loss. You’ll feel reinvigorated mentally and physically from it’s potent anti-inflammatory benefits as well. What exactly are these Moringa Isothiocyanates? MICs are very similar to the isothiocyanates such as sulforaphane found in Broccoli Sprouts (which are all the rage these days), but it turns out Moringa Isothiocyanates are better because they stable (unlike sulforaphane which is unstable and needs to be stored at -20°C) and studies have shown them to have equal or stronger biological activity. In this study, they blended Moringa leaves and the MICs remained stable even after 30 days stored at 37°C (98.6°F)! MICs and Sulforaphane are both potent inducers of phase II detoxifying enzymes (the nrf2 pathway) and provide protection against oxidative stress and chronic inflammation. They have profound weight loss, detoxification, anti-aging, and anticancer benefits. They have profound weight loss, detoxification, anti-aging, and anti-cancer benefits. There are a handful of molecules that could be characterized as being close to a panacea – in that they can help almost every chronic disease — Isothiocyanates are one of them and Isothiocyanates derived from Moringa may very well be the best kind. How do you use Moringa to Lose Weight? Be sure your Moringa is made from Pure Leaf – Moringa Isothiocyanates are concentrated in the tiny green leaves of the Moringa Oleifera tree. Avoid brands that include roots, stems, or seeds. Be sure your Moringa is not over-processed – Do some due diligence to be sure that your Moringa Powder is not processed in a way that destroys Moringa’s MICs! Remember, Sun-Drying causes the most nutrient loss (unfortunately this is still the most common on the market 😞). Shade-drying, which requires Gamma-Irradiation ☢, destroys all of Moringa’s Isothiocyanates. Over pulverizing (this is done so producers can include the heavy, low nutrient stems and branches and go unnoticed) also leads to substantial nutrient loss so you want to avoid Moringa powder that appears too fine (Moringa is not Matcha. Producers of too fine, over-pulverized Moringa are not using slow, stone-mill grinders as is done with Matcha in Japan, they are simply obliterating it and destroying most of the Vitamins in the process). 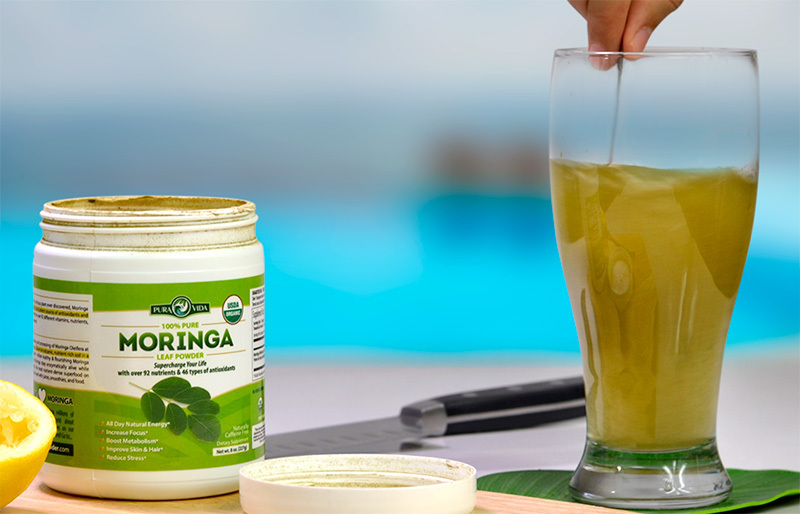 Consume 8-12 grams of Moringa Powder per day – This is the equivalent of roughly 2-3 teaspoons of our Moringa Powder. Consume one serving of Moringa in the morning – This can be with your omelette, oatmeal, or the potent Miracle Morning Elixir. Your Morning serving of Moringa is important for balancing blood sugar throughout the day. Have one more meal (lunch, dinner or a snack) with Moringa included – Keep Moringa’s anti-inflammatory and sugar balancing Momentum going with another serving in the afternoon. The healthy dose of vitamins and nutrients is a great way to beat the afternoon slump. The great thing about Moringa is that it can (and perhaps should) be added to your meals. You don’t have to remember to take it 30 minutes before you eat like other weight loss supplements! The blood sugar balancing effect of the antioxidants is still effective even if it’s taken with food. And the inflammation lowering benefits are actually even improved by the inclusion of fats (which help your body absorb the nutrients). Which Moringa Recipes are Best for Weight loss? Because our Moringa is sugar free, low carb, high fiber, gluten-free, and loaded with plant-based protein; it is a fantastic addition to every Keto, Paleo, and Whole30 diet recipe. For weight loss we highly recommend our Moringa Miracle Morning Elixir to start your day (you can even add a shot of Apple Cider Vinegar!). And from there you can try any of our many Moringa Breakfast, Lunch & Dinner, and Snack recipes to get you to the 8-12 grams per day goal. This is a living post and we’ll continue to update it as new science comes in. It’s great to see Moringa in the spotlight and getting so much attention from the Scientific Community recently! Below is our post from 2012 that was written before any of the above studies took place. It was written in response to shady companies promoting Moringa as a miracle weight loss supplement. Look — we love Moringa Oleifera (obviously), but recent claims by some companies that Moringa Oleifera is a miracle weight loss supplement are quite a stretch. There are no known fat burning or slimming properties to Moringa Oleifera. Moringa Oleifera is meant to fully nourish and energize your body. Meeting all your bodies nutritional requirements will naturally curb junk food cravings and supply you with the energy you need to maintain a healthy & active lifestyle. But it is not a miracle plant that will melt your extra pounds away. No responsible or serious Moringa company would make these claims. If you see one of these fly by night companies marketing the product as such, you should really question the ethics of that company and the quality of the product. We wish everyone had Moringa in their home, but for the right reasons and with the right expectations. Previous articleMoringa Powder Pesto Sauce Recipe – Supercharge Your Pesto! Can you consume Moringa with thyroid meds?? HYPOTHYROIDISM: Animal research suggests that moringa might decrease the conversion of thryoxine (T4) to the active thyroid hormone triiodothyronine (T3) (16348). Theoretically, moringa might further reduce thyroid hormone levels in people with hypothyroidism or subclinical hypothyroidism. Additionally, moringa might reduce the effectiveness of thyroid hormone replacement therapy in people taking levothyroxine or other synthetic forms of T4.